It's been raining a lot lately, and when you wear glasses the rain is even more annoying. 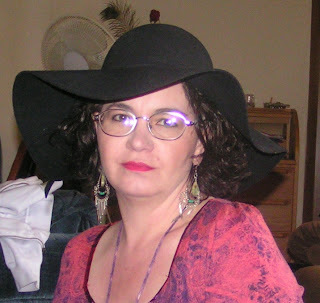 Well, I've been inspired by some fabulous ladies who blog and pulled out my big floppy hat. I'm looking cool and can see clearly - and I finally got the Kate Moss lipstick that I've been considering. I hope to get more comfortable in front of my camera and figure out how to pose and not look goofy but it will take some practice. I should take some lessons from that girl child of mine. She's quite the ham. My heart goes out to everyone affected by yesterday's tragedy. I don't even know what else to say.